For those who use electric wheelchairs or other types of mobility vehicles, ensuring that the home is wheelchair friendly is incredibly important. There are many things that can decrease accessibility, such as narrow doors or raised door frames, but of all areas in a home, often the front steps present the largest hurdle. Since building a wheelchair ramp takes up a lot of the front yard, with the same being true of modular metal wheelchair ramps, which are more expensive, many wheelchair users turn to vertical platform lifts to increase accessibility. Vertical platform lifts are often called wheelchair lifts or porch lifts, as they are most often seen on the front porch of a home. 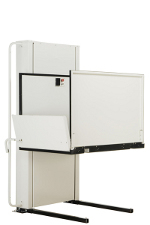 In many ways, vertical platform lifts are very similar to elevators, however unlike an elevator, a vertical platform lift is a completely self-contained unit. The lifting system, lifting shaft, and lifting platform are basically a single unit, which can simply be placed next to a staircase, typically without having to preform any major modification to the home. Porch lifts work by raising a metal platform from the ground to the staircase landing. The porch lift is placed directly next to the staircase landing and rises vertically. Most have a base lifting height of about 4 feet, which can then be upgraded as needed. The shaft of the wheelchair lift is designed with stability and weight capacity in mind. It is not uncommon for a wheelchair lift to support more than 700 pounds, so multiple people can use it at once, or the device can be used to make bringing groceries or furniture into the home. The platform of most wheelchair lifts is surrounded to prevent rolling off of the lift while it is in motion. Many also include locking gates for the top landing, which can greatly reduce the risk of a fall. These types of safety gates and doors are often a requirement for commercial wheelchair lifts. As a result of how these devices are used, vertical platform lifts work incredibly well on the front porch of a home, but will not work with many residential indoor staircases. The exception being schools, churches, and other commercial buildings, where vertical platform lifts are often well suited for indoor use. Whether the wheelchair lift can be used indoors depends on if the lift can be placed next to the landing and rise high enough to reach it. Most wheelchair lifts have a maximum lifting height of 12 feet. 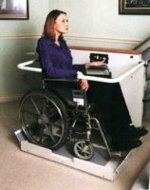 Instead, for indoor use, an inclined platform lift is often a better choice to increase wheelchair accessibility. Inclined platform lifts use a metal track that is attached to the wall of the staircase, running its entire distance. A car, which consists of a large platform and is surrounded by a protective gate, moves along the track, carrying a single wheelchair user. Inclined platform lifts can be pretty large though, so on narrower staircases, they might not work. However, when not in use, the inclined platform lift can be folded, so the staircase can still be used.